""We’ve been very pleased with our collaboration with GSP during the development and execution of our brand re-launch."" Boyd Coffee Company, founded in 1900 in Portland, Oregon, is one of the oldest family-owned coffee companies. 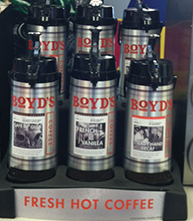 Boyd’s Coffee is available in thousands of c-stores, hotels and restaurants across the United States and Canada. Boyd’s challenged GSP to update their coffee bar with new POP to create a streamlined set that could be used in all retail locations for a consistent look—and help solidify the brand. GSP recommended new fixtures, POP materials and graphics that would create a unique go to coffee destination for Boyd’s that could be implemented anywhere and easily maintained from store to store. 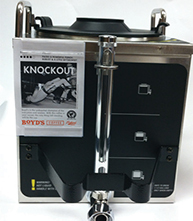 GSP played a pivotal role in creating Boyd’s new coffee bar set which consists of several key components: shadow box frames, wallpaper graphics, brushed aluminum wraps and other equipment decals. Boyd’s personnel were given detailed instructions of what to order for the new sets and how to execute in-store based on the size and style of each account. In addition, GSP provided POPAssetManager™ for improved inventory management and 24/7 online ordering—enabling Boyd’s personnel to quickly order new sets or replacement graphics at their convenience.